Artificial grass drainage technology is great for stopping pet odors. 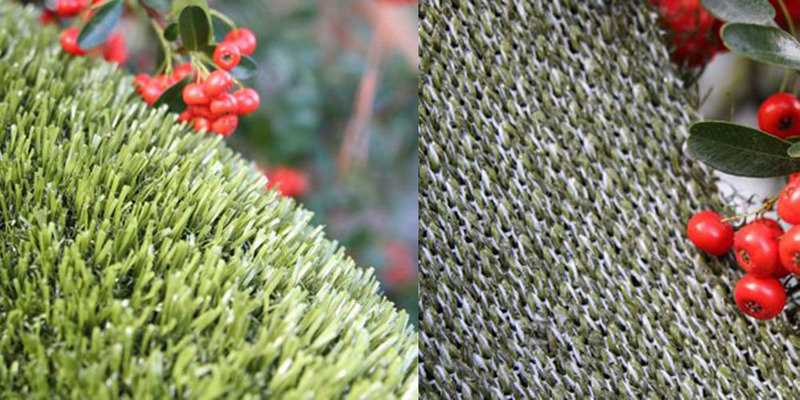 Some artificial grass types incorporate Flo-Rite-Thru technology. However, most of our pet grass is fast draining so this is not something we find necessary any longer. Therefore, we have stopped carrying turf with this drainage system. If you are interested in learning more about how artificial grass drainage technology works, please read on. Indoor and outdoor animal zones run the range from big to small, but all of them need to be easy to clean and quick to drain so that waste and smells don’t build up. Dog runs, kennels and board hotels, vet clinics, and home yards are just a few of the places where artificial grass drainage technology makes sense. This eco-smart pet grass can keep a dog zone clean and fresh so it is a nice place for people and for pets. The key to the cutting-edge design that gives such quick and full artificial turf drainage is not quite where you might think. It is not in the thatch, or in the shape of the grass blades. What sets this pet lawn in a class of its own is its backing mesh. The unique tech at work in the base of this turf means that the grass won’t hold smells, even when large groups of dogs make use of it for potty and play in a big dog run or park. Watersavers Turf is glad to stock pet grass that’s made with this great new technology, along with all the tools you need to install and care for your fake lawn. Most faux sod has a backing that is made from a base of nylon fibers. Those can trap liquids and waste, which is no good for a pet area. Flo-Rite-Thru was a woven mesh that was coated to let urine and waste drain right away, before it could be absorbed into the fiber. The fact that there is no delay as liquids pass through the base means that the lawn will stay dry and clean. Another source of that smell is the gas that forms in dog urine. You can stop that gas from being made if you choose the right infill for your new fake sod. For the best odor control, choose ZeoFill. This helps when waste goes through your lawn. This infill soaks it up to stop smells. You can keep your pet area as dry as a bone, and just as odor free. We sell some of the fastest draining dog turf, but all types of synthetic turf for dogs will drain more quickly and fully than live sod will. There’s more than one reason for that. One you can see right away is that live grass grows out of dirt. We all know that dirt turns to mud when it gets wet. Think of the change you will see when you trade all the mud and dirt that comes with live grass for the clean, soft, dry ground of a faux lawn! What you might not know about, and why it matters for your fake grass to drain fast has to do with what’s in dog urine. When dog urine stays on a lawn, the PH factor and the high nitrogen load will eat right through the blades of real grass over time. This is why you can often tell where in a yard a dog has laid claim to a potty spot. You just need to keep an eye out for brown zones on the lawn! With our fast draining pet turf, there’s no chance for the turf to wear down that way. Since the waste drain down past the grass as soon as it hits, there is no chance for the grass to be worn bare or brown by harsh chemicals in your dog’s stream. That means your pet lawn will last longer, so your pet turf can stay green and lush for years. Take your dog zone to the next step with our fast draining pet lawn. We have some of the best pet grass in the world of turf. Your new lawn will smell clean and it will last for years. You will be glad you made the switch, and so will your dog! Contact Watersavers Turf to make sure your next purchase of pet grass is with us. We have a full range of all the tools you need to install faux lawn the right way. Get a free Watersavers quote on the cost of your pet turf, come visit a store in the SF Bay Area, or give us a call at 844-974-8873.